This entry was posted in Horrorfest and tagged Bank Robber, Book turned into a Play, Born Evil, Creepfest, Creepiness, Creepy, Evil, Eye Color, Facebook, Film based on a book, Film based on a Play, Genes, Good and Bad, Hair Color, Halloween, Height, Horrorfest, Inherit Personality Traits, Inherited, Motion Picture, Nature vs. Nurture, Nurture Vs. 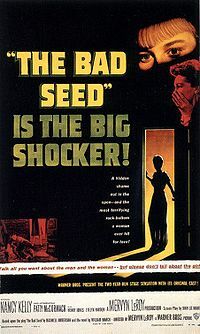 Nature, People, Personality Traits, Play, Psychology, Scarefest, Scary Movies, Serial Killer, Supervillian, The Bad Seed, Title Card, Villain, William March. My partner and I stumbled over here coming from a different page and thought I might check things out. I like what I see so now i’m following you. Look forward to looking over your web page yet again.